Happy Monday Everyone! I hope you're already starting on your summer fun! I want to let you know what I'm doing this summer because it's a little different. I will have a few author guest posts in late July and August. But starting Monday July 11th, I'll be posting on Mondays and offering a giveaway of some of the fantastic MG and YA ARCS and books that Harper Collins has been so generously sending me. One winner will win the book of their choice each week. I'll keep adding books to the giveaway choices, but will keep the original choices. I hope you'll stop by to enter for yourself or someone you know. While I'm doing these more laid back posts, I'll be busy planning my 2017 schedule. I'm also hoping for some relaxing weekend days where I can sit and read. 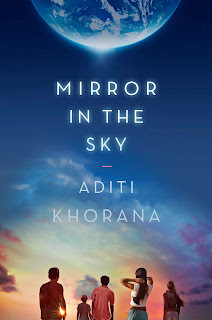 Today I have debut author Aditi Khorana here to share about her YA contemporary with science fiction elements A MIRROR IN THE SKY. It sounds really interesting with all the questions it raises about your life choices and the paths you didn’t take—the big questions I’ve certainly been grappling with these last few years. It sounds like a great read for me this summer. scholarship, feels overwhelming and impossible. Her junior year begins in the wake of a startling discovery: A message from an alternate Earth, light years away, is intercepted by NASA. This means that on another planet, there is another version of Tara, a Tara who could be living better, burning brighter, because of tiny differences in her choices. Hi Aditi! Thanks so much for joining us! Thanks so much for having me! I’ve been writing fiction, screenplays and essays for a very long time, but in the evenings, on the weekends, essentially on the side of my regular paid work. I always had day jobs that required me to write, travel, research and interview people, which gave me a lot of material to work with. My first attempt at a novel was in 2012. That book took me a year and a half to complete and ultimately didn’t sell. In a totally despondent state, I wrote Mirror in the Sky. Failure allowed me to really dig deep and stay in a vulnerable place till I finished the manuscript for MITS. 2. Sounds like you have definitely had jobs that have really helped with your writing--and that were really interesting. Where did you get the idea for A MIRROR IN THE SKY? I wrote MITS in 2014, right around the time that Cosmos was airing on TV. I kept seeing all these articles in the news about the discovery of Earth-like planets, and I started to realize that we probably will discover intelligent life on other planets at some point in my life. I was also going through a difficult time, questioning many of my own life choices, and a good friend sent me a Dear Sugar column: The Ghost Ship That Didn't Carry Us. This column gave me goose bumps and made me think about all the paths we don't choose. What happens to those possibilities? Are there alternate versions of us somewhere out in another dimension living the lives we didn't live? And what if we conclusively learned about the existence of our Other selves? How would that shape the way we see ourselves? 3. Those are some deep questions. You also worked as a journalist at ABS News, CNN, and PBS. How exciting! Have these jobs shaped your writing at all or helped you in writing A MIRROR IN THE SKY? How? I think working as a journalist made me an economical writer, and that is saying a lot because brevity isn’t my forte. I also learned quite a bit from interviewing people and spending a considerable amount of time walking in their shoes, sussing out their motivations, their fears, their ambitions. The most important thing being a journalist taught me was writing on a deadline, and finding and presenting the most important elements of a story in a very short span of time. 4. I write on a constant deadline so understand what you mean. Share a bit about your main character Tara and any surprises you learned about her as a character as you wrote her story. feels like an outsider – like she stands out because of her differences, but she’s also simultaneously invisible. I think this is ultimately what social marginalization – whether it’s based on race, class, gender – is ultimately about. For many people, feeling self-possessed, comfortable in your own body and entirely belonging to the place where you live is a luxury. This luxury isn’t automatically afforded to people of color or other marginalized groups. This is certainly how I felt when I was one of the only people of color in my high school. But Tara’s toughness and her sense of humor about her circumstances really surprised me and made writing MITS really fun. 5. Yes, I've heard from others that being the only minority is a very challenging situation. What was the biggest challenge in writing this story—plot, character development, voice, etc.—and how did you overcome it? I struggled with plot because there are quite a few story threads and yet, it’s ultimately a character-driven novel. I wanted to play up the mystery of the mirror planet and maintain an atmospheric tone and that’s difficult to do when there are so many storylines to keep track of! 6. I’ve read reviews of your story that rave about the character development of all the characters in your book. Share your tips for creating such in-depth, riveting characters. Working as a journalist and as a researcher definitely played a role in my ability to craft the characters in MITS. I also moderated focus groups for many years as a qualitative researcher. This helped me get a sense of how people speak, what they say, what they don’t say, and what they’re really saying. Creating in-depth characters is really about observing people very carefully, asking thoughtful questions and being an empathetic listener. 7. What great advice! Your agent is Jenny Bent. How did she become your agent and what was your road to publication like? Through the traditional route! I queried her, along with a handful of other agents. I was very lucky with the process of finding an agent and publishing house for MITS. I’d say from starting the manuscript to getting a publishing deal, it took a little over six months total. This is very unusual, and I was extremely fortunate, but it does happen. My first offer of representation came in within 48 hours of querying. By the end of the week, I had several offers from a number of wonderful agents. I chose Jenny Bent because she’s fantastic and she was so passionate about MITS. We revised the manuscript over the course of a couple of months before it was sent to editors. It sold in an auction to Razorbill/Penguin. My editor, Jessica Almon is a dream editor. I feel like she’s a mind-reader who can basically intuit what I’m trying to execute in my work even when I’m struggling to express it into words. She’s also become a wonderful friend through the process of working on two books together. 8. I think we'd all like to have your road to publication story. You have also worked as a marketing executive for Hollywood studios like FOX, Paramount, and SONY. Has your marketing background helped you in your promotional plans for your book? How? And what tips do you have for other authors trying to market their books? This seems like a big challenge for many writers. I think working in entertainment marketing taught me that marketing and promotion is a collaborative endeavor, and that there are people who are far more skilled at promotion than I am. I’ve had the chance to work with the best publicity team I could have asked for, and their ideas for marketing and promoting MITS have been phenomenal. This is an arena where I really trust the experts. At the moment, I'm working on two novels: a YA feminist fantasy set in ancient India during the time of Alexander the Great's imperial conquest of the region, and an adult novel. It's literary fiction about an immigrant family contending with a secret about their past. Aditi has generously offered an ARC of A MIRROR IN THE SKY for a giveaway. To enter, all you need to do is be a follower (just click the follow button if you’re not a follower) and leave a comment through July 9th. If your e-mail is not on your Google Profile, you must leave it in the comments to enter either contest. On Friday, I'm participating in the Freedom to Read Giveaway Hop. I'll have a lot of great choices for you. Starting Monday, July 11th, I'll be doing a Monday giveaway of MG and YA books from Harper Collins. I hope you'll stop by and enter to win a book for yourself, your child, or someone else you know would enjoy these books and ARCs. Hope to see you on Friday! And have a great July 4th Holiday! Beautiful cover and I love stories about outsiders. Enjoy your weekends. She was fortunate it happened so fast and she had multiple offers. As part of a biracial marriage I can identify a bit with this character. When we are with my family, my husband is the only one with his skin color and it reverses when I am with his. But it didn't take long for me to stop seeing color once we were dating and I even found myself looking at other biracial couples and thinking, "Hmm. I wonder what's that's like?" Such a great idea for a story. I loved her process for creating characters. This story should be a hit for the YA crowd. Aditi has quite an impressive background. Here's wishing her the very best for her book. Wow, this sounds like a fascinating story! I am super intrigued, and plan to make a writing exception from my nearly-all MG diet to read this one, whether or not I win. Congrats, Aditi! Your speedy path to publication makes sense when you look at all of your prior experience - both personal and professional. Kudos! Cool she's worked for some studios. Really like the story idea as well. Wow! I'm quite impressed with how quickly she found an agent and a publisher, but I can see why. This is an interesting premise with a lot of depth. And her next story set in India sounds fascinating. Congrats to Aditi! It's so nice to meet Aditi! MITS sounds like an interesting read. I love hearing about an author's background, and how it factors in to their process. Thank you, Natalie. Appreciate you sharing the interview. I'll pass on the giveaway this time. Happy 4th to you as well! Congrats Aditi! The book and your journey sounds fantastic! What a beautiful cover. This book is about such an important and relevant topic. Wow Aditi, six months! That's an inspiration. Congratulations on your first book. I love a sci-fi and look forward to reading it. What a fascinating premise! Congratulations on your upcoming debut! Thanks for the interesting interview. Beautiful cover! Please let someone else win. My TBR pile is too high. Thanks for the interview and chance to win a copy. I love the sound of this. Thanks for the great interview. What an interesting spark to the story idea, irrevocable choices and alternative paths that ones life could have gone down. I'm going to add it to the TBR, but please don't enter me. Wonderful interview. Have a happy 4th Natalie! Wow, like others I'm a bit stunned by the short road to publication! I think this is one of those examples that makes aspiring authors get all green with envy. Ooh! TBR list. I'll take a little science fiction to spruce up my week. What a fantastic premise! Natalie - I hope you get some relaxing time to read on the weekends as well! Happy 4th! You must have fantastic stories from your journalism career. Sounds like an interesting book. Great cover! I enjoyed learning more about the author. :) Wishing her all the best! I hope you do get a chance to relax and read this summer, Natalie. You deserve it. 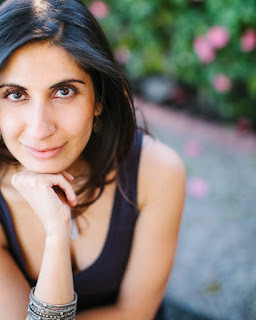 Wonderful interview and Aditi, I love the idea of Terra Nova. Fascinating premise. Thanks for the opportunity to win an arc. The book's premise sounds so interesting and complex! I'm very impressed Aditi worked as a journalist for CNN. I really enjoy that show. Wishing Aditi much success with her new book! Sounds interesting, and so does the other YA she's working on! This book was far different than I expected, far deeper. The story exists at this wonderful nexus of philosophy, physics and friendship. It's about unearthing our secrets and learning to sift truth from hope. Lovely writing and beautifully drawn characters.